In light of the current economy, many people are talking about silver coins as investments these days. But what has the history for silver prices been like? And what are some popular silver coins to invest in? While this article is not intended to be used as investment advice or investment information, it will hopefully help shed some light on the silver market. We’ll concentrate on the history of the silver market and how silver prices have changed — past, present, and future. Remember, though, investing in any aspect of the volatile coin market should be done at your own risk. Silver has always been a desirable metal. Silver coins have been around for centuries, and the U.S. Mint has been producing silver coins since its earliest years. Silver prices rose high enough during the early 1960s that the U.S. Treasury and U.S. Mint decided it could no longer produce 90% silver coins for circulation. Why? It wound up that the silver in the dime, quarter, and half-dollar was actually worth more than the face value of those coins! With silver rising above $1.20 an ounce at the time, in 1965 the U.S. Mint switched to using copper-nickel for the dime and the quarter and 40% silver content in the half dollar. In 1971, all silver was removed from the half-dollar. During the 1970s, inflation and a failing economy pushed the prices of everything from gasoline to milk through the roof. Even interest rates were climbing to monumental highs. At the time, Bunker and Herbert Hunt (2 brothers in the Hunt family which, at the time, was among the nation’s richest oil families) had been heavily investing in silver. In fact, during the course of the mid-to-late 1970s, their silver purchases began influencing the silver market. Silver prices quickly rose above $10 an ounce in 1979, and people were trading in their silver coins for cash. In January 1980, silver had reached an all-time high of nearly $50 an ounce. But silver prices quickly fell, and by late 1980, silver had stabilized to roughly $10 an ounce. Investing in silver coins remained popular, but the rush to sell and melt silver coins had cooled off. Throughout the 1980s and 1990s, silver prices were generally stable, except for peaks and dives which would send silver down below $5 and over $8 at times. With another recession on hand, people began looking to tangible investments again, including silver. Silver, at one point in the 1990s, could be had for under $4 an ounce. But by the middle-2000s, silver was looking to increase above $10. With silver prices back up, investing in silver coins again became popular. Also, more people began selling silver coins. Silver prices rose to roughly $20 an ounce during the spring of 2008. While the price of silver dipped closer to $14 an ounce over the following year, the overall demand for and tangible quality of silver continues to intrigue investors. Silver is now over $21 an ounce. Silver bullion coins, such as the popular U.S. silver eagle coin, sell briskly and are filling up investors’ portfolios. So, what is the future of silver projected to be like? Nobody really knows the precise answer to that question, but it is safe to say that silver, which is a limited natural resource, will continue to be in demand. Don’t forget that a large share of the silver demand comes from industries such as photography and technology. As silver continues to be spread among many market sectors, the vital need for the precious metal will inevitably keep investors’ interests heavily in silver. Whatever the case, silver coins will continue to be one of the key ways that investors buy, sell, and trade their investments in the metal. 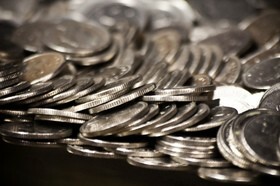 Wondering which silver coins are the most popular and common among silver investors? Except for the Silver Eagle, these coins are usually bought in circulated condition in bulk quantity. Often, these circulated silver coins are called junk silver coins. These are the most common silver coins investors buy because they are relatively inexpensive, plentiful, and popular. That makes these coins generally easier to find and sell. Here are the top 5 places to find junk silver. While all of the coins listed above are at least 90% silver, the Silver Eagle is a bullion coin that is nearly pure silver. Many investment plans (specifically retirement plans) also specifically recognize the Silver Eagle as an investment coin. In other words, Silver Eagles often qualify for certain tax exemptions.